Medical research, device development and training in surgical and interventional procedures require accurate anatomical and functional models. Ideally, these would provide an accurate and lifelike representation of human anatomy and physiology, be ethically sound and uncontroversial, present few or no infection or chemical risks to users and have a long useful period. Phantoms, animal models and fresh, frozen and formaldehyde embalmed cadavers all fall short in these areas. Cadavers soft-embalmed using the Thiel method, however, maintain faithful colour and flexibility, can be stored for up to three years and use minimal amounts of dangerous chemicals; therefore, they fulfil many requirements of an ideal model with the exception of realistic physiological function and movement. 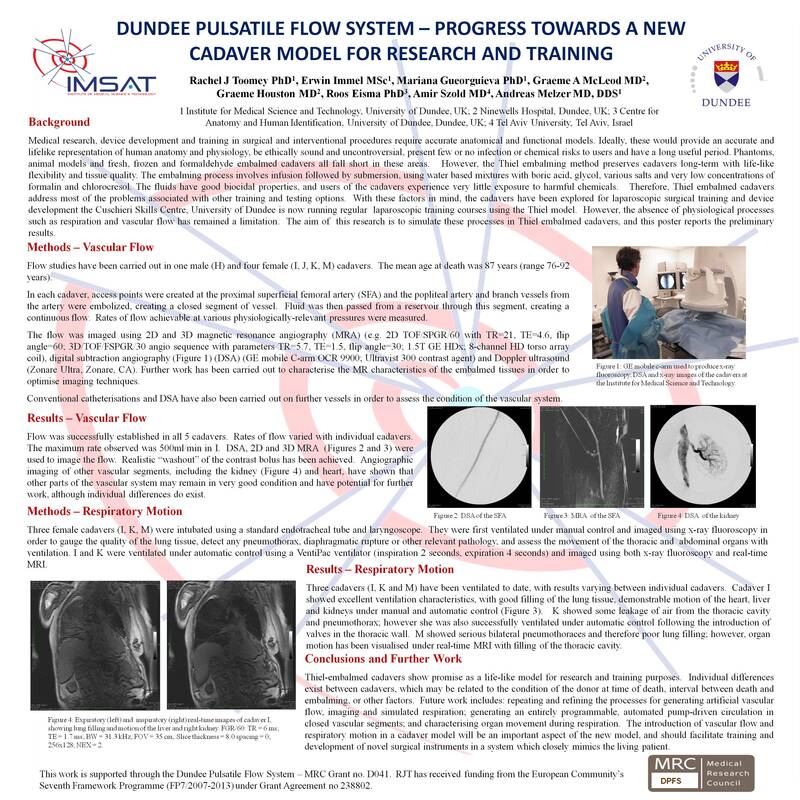 The Dundee Pulsatile Flow System (DPFS) aims to re-establish pulsatile vascular flow and respiratory motion with automatic control in Thiel-embalmed cadavers, generating a suitable model for research, training and instrument / device development. It also seeks to optimise imaging techniques for use with the cadavers. Simulated vascular flow has been achieved in the superficial femoral artery (SFA) of three female and one male cadavers (min/max weights approximately 60-80kg). Proximal (near the point at which the common femoral artery bifurcates into the profound and superficial arteries) and distal (popliteal) arterial access were established, allowing fluid to be passed through the SFA. Rates of flow achieved with different, physiologically-relevant pressures were measured and recorded. The flow has been made pulsatile under manual control. The flow was imaged using 2D and 3D magnetic resonance angiography (MRA) (e.g. 2D TOF/SPGR/60 with TR=21, TE=4.6, flip angle=60; 3D/TOF/FSPGR/30 angio sequence with parameters TR=5.7, TE=1.5, flip angle=30; 1.5T GE HDx; 8-channel HD torso array coil), digital subtraction angiography (DSA) (GE mobile C-arm OCR 9900; Ultravist 300 contrast agent) and Doppler ultrasound (Zonare Ultra, Zonare, CA). Further work has been carried out to characterise the MR characteristics of the embalmed tissues in order to optimise imaging techniques. Two female cadavers have been successfully intubated and ventilated both manually (approximately 10-15 breaths/min) and with a portable MR-compatible ventilator (inspiration – 2 seconds, expiration – 4 seconds; 10 breaths/min). Fluoroscopy and real-time MRI have been utilised to image this simulated respiration. Maximum rates of flow though the SFA have varied with individual vessels; the greatest rate achieved was 800ml/min. MRA, DSA and Doppler ultrasound have each visualised the flow successfully. Analysis of T1 and T2 relaxation times of embalming fluids and embalmed tissues have provided insight into optimising MRI techniques. The cadavers responded well to artificial ventilation, both automatically and manually controlled. Movement of thoracic and abdominal organs, a factor which is crucial in therapeutic and diagnostic procedures, has been visualised. The results to date show good progress towards producing a cadaveric model with simulated physiological function which is suitable for imaging and intervention. Future work includes: repeating and refining the processes for generating artificial vascular flow, imaging and simulated respiration; generating an entirely programmable, automated pump-driven circulation in closed vascular segments; and characterising organ movement during respiration.